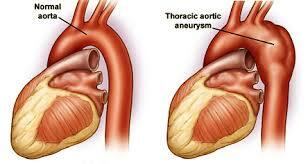 Thoracic aortic aneurysm (TAA) refers to a localized pathological dilation of the thoracic aorta. It is a balloon like dilation of the vessel wall thought to be the result of weakness within the wall. It is associated with cystic medial degeneration. It can be caused by a variety of of factors including hypertension and connective tissue disorders. This dilation can progress to leaking, dissection, and/or rupture of the aorta (all of which are very serious and potentially fatal). Chest/abdominal pain can be present and is a sign of leakage, dissection, and or imminent rupture of aorta. Cardiac exam can reveal murmur due to aortic valve insufficiency. 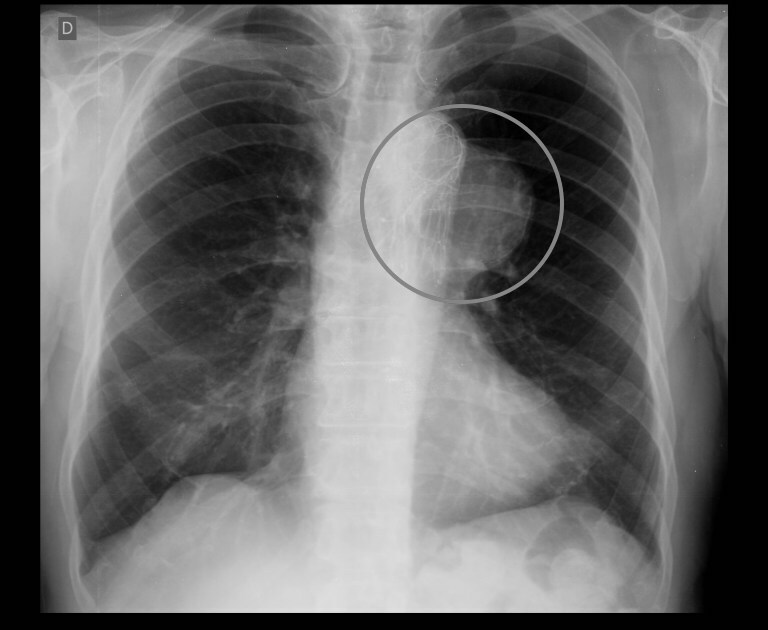 X-ray: abnormal aortic contour/size on a chest X-ray is suspicious for TAA. 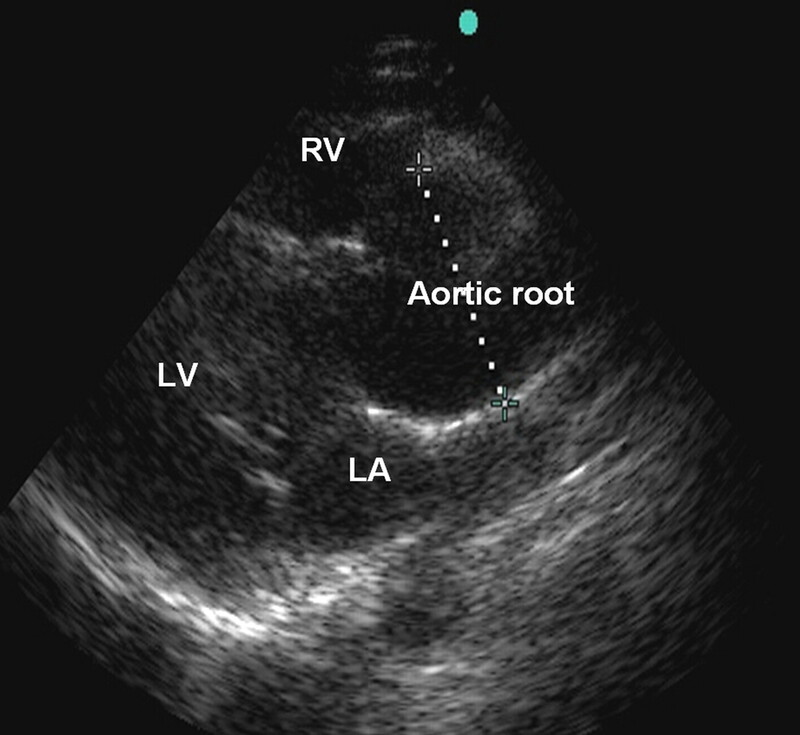 Echo: enlarged aortic segment can be seen on echocardiography. Once clear suspicion of TAA, use CT or MRI to evaluate extent of the disease! Surgery may be needed for symptomatic patients or those with an aneurysm that is rapidly growing. Medical management is reserved for stable asymptomatic patients. This will depend on the nature of the aneurysm. Some patients are able to be managed medically, others may die from this condition if it is not corrected surgically. Close monitering of patients who are high risk for TAA (those with connective tissue disorders) may provide some benefit in early detection. Those with Marfan syndrome can be given beta-blockers to reduce rate of aortic dilation. Proper management of suspected/known syphilis can prevent some cases of this condition. Aortic valve insufficiency/aortic regurgitation can be caused by dilation of the aortic valve root. 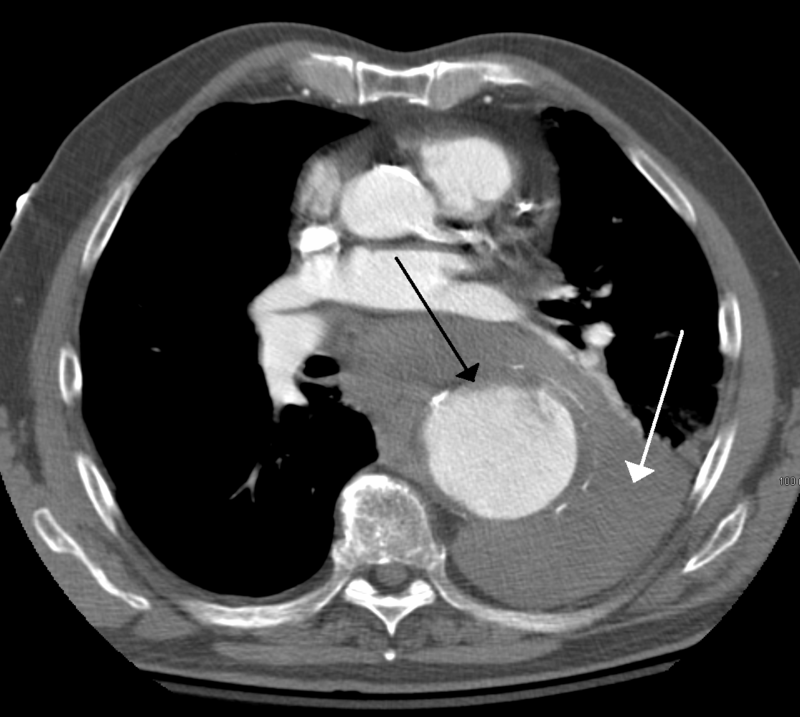 Syphilis: Syphilitic heart disease/tertiary syphilis can cause a thoracic aortic aneurysm by endarteritis of the vasa vasorum results in luminal narrowing, decreased flow, and atrophy of the aorta’s wall. Horner syndrome can be caused by a thoracic aortic aneurysm due to impingement of the sympathetic nerves of the face. The classic presentation is ptosis, pupil constriction, and anhydrous on the affected side.